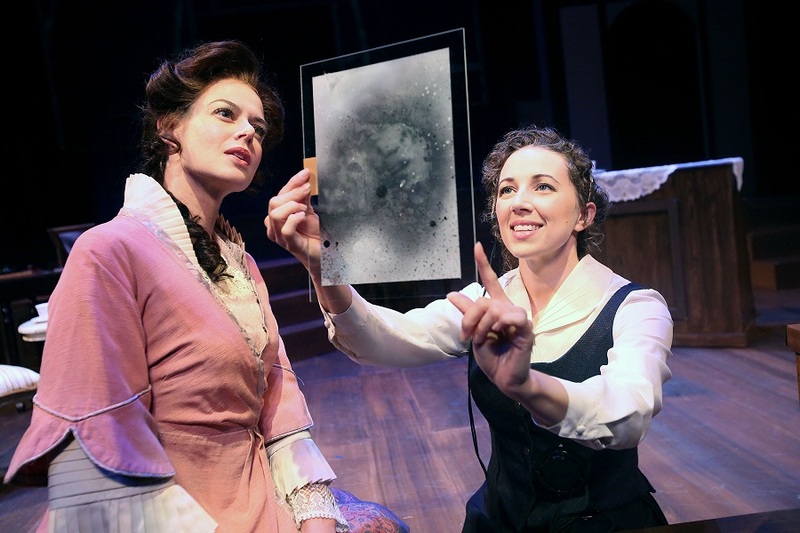 Photo of Erin Anne Williams and Jennifer Cannon by Tracey Roman, courtesy of International City Theatre. Despite many odds, astronomer Henrietta Swan Leavitt (1868-1921) discovered a method to measuring the distances of faraway galaxies. Without ever being able to use a telescope, an activity not allowed of women at the turn of the 20th century, Leavitt and her female colleagues at the Harvard Observatory used math and measurement to map the skies. “Silent Sky”, by acclaimed playwright Lauren Gunderson, opened last week at International City Theatre (ICT). Directed by Todd Nielsen, actors Jennifer Cannon, Jennifer Parsons, Leslie Stevens, Eric Wentz and Erin Anne Williams bring Leavitt’s story to life through Gunderson’s fictionalized biography. Gunderson, who made American Theatre’s Top 20 Most-Produced Playwrights of 2016-17 and is a recipient of the Lanford Wilson Award from the Dramatist Guild of America, said Leavitt’s moment of discovery inspired her to write Silent Sky. Working without recognition, the practicality of a telescope and in a male-dominated field unwilling to treat women as equals, Leavitt discovered more than 2,400 variable stars, which in her day was approximately half of the known total. By observing cepheids, a class of variable star, Leavitt discovered a direct correlation between the time it took a star to go from bright to dim to how bright the star actually was, according to the release. Based on Leavitt’s work, astronomers including Edwin Hubble was able to make their own life changing discoveries. Leavitt also developed a standard of photographic measurements accepted by the International Committee on Photographic Magnitudes known as the “Harvard Standard.” She worked at the Harvard College Observatory until she passed away from cancer in 1921, according to the release. The creative team for “Silent Sky” includes set designer Christopher Scott Murillo, projections designer Lily Bartenstein, lighting designer Donna Ruzik, costume designer Kim DeShazo, sound designer Jeff Polunas, props designers Patty and Gordon Briles, and hair and wigs designer Anthony Gagliardi. Casting is by Michael Donovan and the production stage manager is Victoria A. Gathe. Remaining performances will take place Saturday, September 2 and 9 at 8:00PM and Sunday, September 3 and 10 at 2:00PM. Tickets are $49. For more information, visit the website here or call (562) 436-4610. ICT is located in the Long Beach Performing Arts Center at 330 East Seaside Way.